Trips from UK residents are down 7% so far this year. BRITONS HAVE TAKEN 105,000 fewer trips to Ireland so far this year as the pound’s Brexit-related plunge hits the key market. In total, British residents took around 1.44 million trips to the island from January to May of this year – down about 7% on the same five-month period in 2016 – according to new figures from the Central Statistics Office. The drop came despite significant visitor increases from the country’s other key target markets, mainland Europe and North America. The news came as no surprise to Tourism Ireland, the state organisation responsible for marketing Ireland as a tourist destination, with chief executive Niall Gibbons blaming market jitters caused by Brexit for the drop in British tourists. “The currency challenge for Irish tourism is very real,” he said, referring to the decline in the value of sterling, which has made Ireland a comparatively more expensive destination for holidaying Brits. Gibbons added that “economic uncertainly” in the UK was making British travellers more cautious about their discretionary spending. “Competitiveness and the value for money message are more important than ever in Britain right now,” he said. 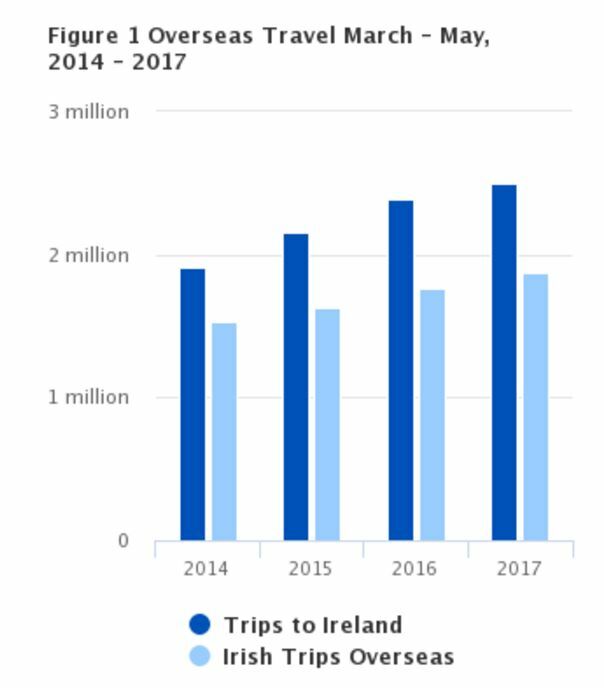 Overall, the number of trips to Ireland by overseas visitors rose to nearly 3.6 million between January and May, a 3.1% increase on the same period last year. While Britain remains Ireland’s largest tourism market – accounting for about 40% of all visits to the island – the North American segment saw the biggest bump, with the number of trips to Ireland so far this year up 24% to 662,700. “A number of factors are working in our favour,” Gibbons said, citing an increase in the number of transatlantic flights out of Ireland. Arrivals from the European market experienced steady growth during the five-month period, increasing by 4% to 1.3 million. Trips from tourists in ‘other areas’ – which includes Australia and emerging markets like China – increased by 22% to 212,900.